“We want to be an empowering voice for young women who dare to be different”. These are the words of three beautiful, strong-willed and independent young women – Fya, Azira and MANGGIS, otherwise known as DE FAM. Due to be released on the 26th of May this year, their debut single and music video, #SUPERGIRLS, embodies the values and principles of powerful women across history. In part, their lyrical content sends across strong and positive messages to young women; encouraging them to work hard, play hard and never give up in pursuing their dreams. As they sing it out in the chorus of #SUPERGIRLS, “Don’t need to worry ‘bout the things they say, you got the power to stand up today”. Born and bred in K.L., these proud ladies met first the first time in high school, where they were brought together through a mutual passion of dance. Fya and Azira were introduced to each other when they joined the “Funky Fresh Family by Floor Fever” in 2008, followed by MANGGIS in 2010. Since then, it was only from regular karaoke sessions that they discovered their synergy and talent in singing could be taken seriously and pushed to the next level. They further explained, “We decided to be a girl group because we realized we are stronger together, and we’ve been dancing behind Malaysia’s finest artists’ for the past 3 to 4 years. Now that we’ve started singing together, we want to step out in faith and bring something new to the Malaysian music industry. 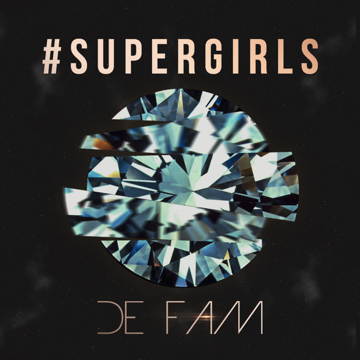 Our debut single #SUPERGIRLS is somewhat a story of our own experiences in making our dreams a reality”. While many groups struggle to establish their musical identity, DE FAM stands out amongst the crowd with a clear vision of their image and musical direction. Before even releasing their debut single with Tune Studios, they’ve already caught the attention of the public with their first online cover of Iggy Azalea “Black Widow”, which spawned over half a million views in the first week alone on Rotikaya’s Facebook page. With the same video, they also garnered almost 100,000 views on DE FAM’s YouTube page. Their talent and popularity has even got a couple of big Malaysian recording labels fighting their way through to sign record deals with these girls. Noticeably, their appearance on Caprice’s number one hit single ‘Xde Hal Bro’ lyric video, which accumulated around 2 million views, further cements their position as true contenders in the music industry. Now, with a 5-Year deal with Tune Studios, they are more than ready to deliver their best to fans across the country, as well as in the region. As quoted by Tan Sri Tony Fernandes, the Group CEO of Airasia, “ These girls are going to be big. They will be the ‘Spice Girls’ of Air Asia”.